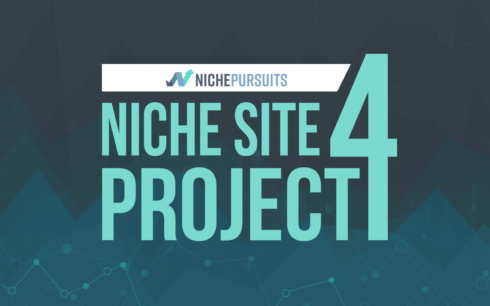 Since I just recently started Niche Site Project 4, I've been getting a few questions about the overall strategy and timeline. This post is my attempt to answer those questions. In addition, this is a good way for me to plan exactly what is going to happen over the next 6 to 12 months and beyond. So, if you are wondering what's the main strategy or what the process or how long should everything take, this post will provide those answers. The end goal of this project is for me to have a website making 4 figures a month (ideally 5 figures a month) with a strong traffic flow from Google. So, a huge focus of this project will be search engine optimization…ranking well in Google and then monetizing that traffic on my website. The way to get traffic from Google is to write great content that users are searching for and then optimizing your site so that Google gives it some “love”. Create a very professional looking website using a premium or custom designed WordPress theme. Write high quality content on lots of keywords in my niche. Target keywords that are easy to rank for and often only get searched for 50 to 500 times a month. Rank well in Google for those keywords (eventually hundreds of articles most likely). Monetize the traffic to my site with Amazon Associates, display ads, or other affiliate programs. Use various link building strategies to give the site more authority and help it rank faster in Google. Use social media, especially Pinterest, to drive traffic to the site. Build an email list and further monetize my audience with my own niche products. Get creative with email list building and niche products to make the site grow even faster. Each of these bullet points could be an entire discussion on it's own. But I thought it was important to list out what my overall plan is for the site. Developing the plan is easy, the execution is difficult. Right now I'm excited about the project and everyone else is excited about building their own sites as well. So, it's important to strike while the iron is hot. But it's also important to realize that nothing extremely profitable is built overnight…or even a couple of months in this case. The reality is that even though I'm starting the project now, the earnings and traffic likely won't get super interesting for at least 6 to 12 months. In fact, it might not be for over a full year before the site starts to do really well. I'm in this for the long haul. As long as I see signs of growth, I don't mind if it takes more than a year to build a 4 figure a month site. I can't predict how quickly this site will start earnings money. Month 1: Pick a niche, buy a domain, get a professional looking theme, and write the first 5 to 10 articles. Month 2: More in-depth keyword research and get a reserve of 100 or so keywords I can target. Get on a schedule of 10 to 20 articles a month. Start Pinterest strategy and link building strategy. Month 3: Expect to see a trickle of traffic from Google, possibly even my first earnings. Month 4: Hopefully see good signs of life in Google with increased rankings and more earnings. Month 5: More content and link building. Month 6: Goal of $500 in earnings for the month. Month 12: Goal of $1000 in earnings for the month. Month 18 – 24: Goal of $2k to $10k+ in earnings per month. Again, I can't predict the earnings. But I think after a couple of years, the site should definitely have potential to be making $5k to $10k a month in earnings. Could it happen faster? Sure. Could it happen slower? Yep. Now having said all that, I'm going to try some things with list building, link building, and niche product building that I haven't tried before that could potentially speed up the earnings. The above timeline is primarily focused on what to expect if I'm relying primarily on traffic from Google. So, Niche Site Project 4 won't be done after 6 months or a year. Not even close. That's when things start to get interesting. When Will You Reveal the Website? A big part of the project is that it's public. I want people to be able to see the site and learn from it. However, at the same time, I don't want people to copy my site from the very beginning or perform negative SEO on it from the start (yes, this happened in my first project). I recently started a discussion on the Niche Pursuits Private FB group here and asked others when they thought I should reveal the site. I have been pleasantly surprised that most people feel I should wait a little while so I can get ahead of the crowd. I agree. So, I don't have an exact timeline for when I will reveal the site. But I would estimate that it will be at least 3 to 6 months. This will give me time to build a professional site, get lots of great content, and hopefully be getting traffic and earnings. Ideally I can wait until the site is making a few hundred dollars a month before the big reveal. But I'll have to play that by ear a bit. Just realize that it's going to be at least a few months before I reveal the domain. Overall, that's the big picture strategy and timeline of the project. What do you think? Go ahead and leave a comment below and we can discuss. Or go ahead and join the private Facebook group here and we can continue the discussion there. Do you intend to target any buyimg keywords at first like best shoe racks…or will they all be info keywords? Thanks for your thoughts. I’m very interested to learn more about your link building strategy … is going to be “white hat” ? Are you going to use your own PBNs or buy the links? As well I’m very interested in the email list … I’ve never built one and I have a site about 1 year old and never collected emails, can’t wait to learn about this as well. Spencer has stated in the past (unless he has changed his mind or execution plan) that he will never again attempt the “easy way” – which PBN process is time consuming and pricey and 50/50 on working effectively and longevity is less than 50%- of black hey methods. And please do not respond to my comments with why it works or not or you found the best PBN… simple answer your wasting your time with methods that are outdated as soon as you buy in. Spencer did a site once using PBN’s and got hit, since then he has mentioned several times on this site and podcasts that he wont do them again. I’m not answering on his behalf but I am pretty confident this site will be white hat, steady link building through safe methods and no “buying of links” or similar. Yes, it will all be very whitehat. No PBNs or shady links. what is your budget for the first year? Great question. I expect to outsource 50 articles relatively quickly. that will be the biggest expense. I’ll have to cover more budget details as I move forward. Glad to see you’re at it again. Your Niche Site Projects always inspire me to make new sites and some how, even after a couple of years of following you, I always pick up new information. After that however, i built 2 sites that are doing pretty well now (i’m closing in on 5 figures) and now that NSP4 starts it inspires me to build another one to get over my 5 figure goal plus the potential to sell one of them later without losing a monthly income. Your kinda like my hero Spencer, thanks for everything! Thanks for the update. I’ve got my niche selected and am just about ready to buy a domain and start some articles. Will you be going over how to build good articles as well? While I know a good starting point are reviews, lists, comparisons, tables and the like, I’m wondering if there’s more that I should be focused on as I feel I don’t have much in the way of good article examples to go off of. is there anything you’ve written about before that could help or will you be covering this in the coming weeks? Yes, I’ll be covering some of those details in the coming weeks. I hope your niche is not in the health industry since the latest google update made it very difficult for average joes to rank in that category. Will you be outsourcing the 10 – 20 articles every month? If so, what’s a good resource for that? Problogger job boards and upwork most likely to find a few good writers. Question can you built or post in the comments a Google sheets for tracking keywords and content management. Still, I’m suffering content writer. Willing to pay $20-$25/1k words but I couldn’t find a good writer. Is this price okay for the a writer? Do you have any recommendation(marketplace or writer)? What price do you pay to your writer in 2018? Should I create foundation linkbuilding? You might need to double that price for a good writer. If you can find someone for $20 to $30 for 1,000 words, that a great price. Sounds great, looking forward to tracking. Definitely think holding off on the domain or niche is the best ploy to start with. An idea might be to pick a “fake” niche when referencing your site. So, you could say it’s about fruit (or something) as you talk about the site for the sake of the blog posts. Then you could say I added 10 articles this week, 5 Best Oranges, 5 Best Bananas etc. so we know the list of the content without revealing the niche. Could go into further detail about the articles as well, just not mentioning your actual niche. Same could be applied to link building, social media etc. So, I found a great blog on pears last week that I was able to get a link to. Lol, doesn’t have to be fruit, but you get my jist. This way we know exactly what you are doing, just not the niche. That’s a good idea, I might do that. Very nice that you started again with this challenge! Im listening to calls with Samara, on last niche site 3 right now in Sweden! Very good info! Looking forward to listen and read more about your project! You are inspiring! Rock on! can u please share your overall budget for this project? If I outsource all the writing, it will be close to $10k. Your budget would be much lower if you do all the writing. WPX, Kinsta, and Bluehost are good hosts. Im really excited to follow along this journey , learn from it , and implement any strategy that I think would help my website. I think you are spot on with your expectations Spencer, mine are very similar. When it comes to writing 10 to 20 articles per month I plan to write some of them but I’m also looking to outsource the majority of this. Do you plan on outsourcing the majority of your content to hit these goals, and if so are you planning to share how outsource this content to get the best possible results? I’m sorry if this is to big of a question to answer in the comments, the only reason I bring it up is because it my biggest roadblock. Yes, I plan to outsource most of the content. Problogger job boards and upwork to start. but I may try other places if I can’t find anything. I think it’s a good idea to hold off on revealing your chosen niche for many reasons, but mainly so traffic numbers aren’t artificially inflated from everyone following along. Thanks for the informative post and announcing the project timeline. I look forward to the next update. This will be 6 months of pushing hard on all kind of things, but NSP4 will be the big focus in the next months. I think i got the niche now, bit risky business with cheap products, but a LOT of traffic on a lot of directions. Thanks for your helpful Article. I want to learn best method of link building. Have you any course? If yes, I am highly interested to join the course. This is interesting. Thank you Spencer for laying down the plan and timeline. Also keep writing remaining 75 articles on the side. I hope to see traffic from around 3 to 4 months. Let’s see how this goes. Starting a new venture with this website. We’ve finished creating the product, and now the fun seo and marketing begins. The hard part in today’s seo is how to build links safely and scale it. I just bought a domain, and i’m planning to follow a long with you! I’m doing it in a foreign language (Danish), so the competetion should be easier than on English, but the reward are most likely also smaller! I wish you the best for the project! I think my plan more and more classified ads posting,social bookmarking,bolg posting….. In SEO nowadays there’s way too much competition, I rather invest money in other tactics, as this is really risky and slow way to start, wouldn’t recommend to anyone. I am one of your dedicated followers who is happy to read your success stories. I have a site that is over 1 year old but has not started earning yet. I need to move with you this time and learn the best link building strategies. Thank you once again for sharing your blogging journey with me and others. Great article – very informative. I am just a total “newbie” to all this and am wondering what I can do to monetize and get traffic to my new blog that I have just created about my retirement experiences. Any suggestions? I want to create amazon affiliate site. I want to know where I can find the expert who can write naturally and attract user to go to amazon via the affiliate link. I would love to join. Is the only way through the facebook group? I currently do not have facebook and do not want to start! Also I would love to know when you started.. there are no dates! You can still join by filling out the application here: https://www.nichepursuits.com/nsp4. That will put you on the email list and I’ll be asking for monthly reports (and giving updates there as well). great timing. I will follow NSP 4 very closely. There’s one thing I have in mind. WIll you start on a brand new domain, expired or auctioned aged domain (non-dropped) ? What I have read in some SEO groups that aged auction domains perform very well compared to a fresh domain. I’m starting a fresh domain. However, there could be some advantages to buying an aged domain…but takes some skill to find and vet those domains. When is this project starting? This is awesome, thanks very much for sharing. I particularly like the realistic timescales you’ve given the project – especially in terms of revenue. I’m continually seeing blogger after blogger posting income reports that show they’ve earned thousands at the end of month one (I’m not saying they’re lying, but their websites look unprofessional and they rank for next to no keywords after such a short time… OK, I guess I am saying that they’re lying!). It’s refreshing to see someone being a bit more believable and realistic, especially someone with your track record!